Style Z1 - The standard for MPP mailer's with all Permit nomenclature between the killer bars. Style Z1A - Placement of the actual permit number is below the bottom killer bar. Use ANY ink color: TYPE Z Mailer's Postmark Permit Rubber Stamps are designed for use with any ink pad to give you the best impressions possible. We recommend any good quality, pigment based ink for fast drying and permanence without adversely affecting the archival quality of envelopes or postage stamps that you may be using. 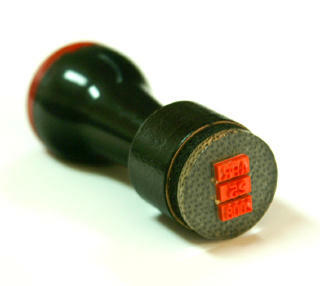 Overall image size of the TYPE Z Mailer's Postmark Permit Rubber Stamp is approx 2.75"W x 1.25"H.